The health informatic profession is growing in popularity as large hospitals and smaller clinics adopt all kinds of information technology initiatives. Whether it’s growing popularity of BYOD programs and on-the-job iPads or a federal mandate for easy access to online medical records, informatics professionals face a large number of challenges that they must overcome in order to link doctors to their patients. 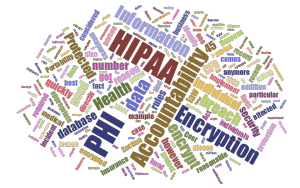 The HIPAA privacy law is just one of those challenges faced by those who choose to pursue a health informatics degree. Within the informatics profession, this law is typically used to guide the safe and secure design of information technology systems so that they safeguard privacy no matter where they’re used. HIPAA was passed in order to grant patients a significant degree of confidentiality regarding their medical records. At the time, most records were contained in print and the law was used as an impetus to keep those records securely stored. Access was granted only to a limited number of relevant, qualified professionals who needed to either maintain or utilize the data they contained. In the modern economy, however, HIPAA increasingly governs decisions made in information technology. Informatics professionals need to know how to implement high-grade security and encryption in their systems in order to protect records from hackers or theft. This is the primary way that the law affects the health informatics profession. Though these professionals are typically not held directly accountable for breaches of security or a loss of confidentiality, their employer can face significant scrutiny from federal authorities if such an event happens. As a result, informatics professionals routinely learn the latest developments and trends in secure encryption and software design. They must meet exceedingly high corporate standards as they design these systems, ensuring they are free of exploits and vulnerabilities. At a lower level, professionals in the informatics industry must be sure that proper training is provided to medical records technicians at hospitals and clinics. Without the proper training on a new software suite, iPad app or smartphone initiative, these employees could accidentally breach security checks and cause records to be less secure than they should be. For this reason, most corporations in the health IT industry hire entire teams to review software, create training manuals, develop certifications, and even integrate new software into medical transcription classes taught at community colleges across the country. Many others in this training role will elect to speak at seminars and continuing education programs for certified physicians. The goal is to both develop a highly secure application and then make sure that everyone who uses it understands the importance of its security features. Finally, adhering to HIPAA guidelines often means subjecting software developments to a legal team who can determine whether or not the software falls within HIPAA regulations for security and confidentiality. The legal team may also review training materials to make sure that the right language is used to convey the seriousness of privacy protection and the imperatives of HIPAA privacy requirements. From legal analysis to hands-on development work, the implications of HIPAA legislation are many. This law is perhaps the most sweeping one to affect patient privacy in the history of modern healthcare, and that means the health informatic industry is directly impacted by requirements to beef up application security, develop intuitive training materials, and participate in seminars that encourage adherence to best practices.